We’d love your help. Let us know what’s wrong with this preview of Sarah's Story by Ruth Elwin Harris. Four independent-minded sisters come of age in the early 1900s -- and four interwoven novels tell their stories, each through a different sister's eyes. To ask other readers questions about Sarah's Story, please sign up. Though this book has been on my shelf for well over a year, it wasn't until it was chosen for the February group read over at the Kindred Spirits group that I finally decided to read it. We chose the book as one "in the spirit of" the works of L. M. Montgomery (i.e., "Anne of Green Gables") and, while Harris' book doesn't equal LMM's in my esteem and affection, I think it was definitely a good choice as it is evocative of LMM's adoration of nature, love of beauty and writing, and her position th Though this book has been on my shelf for well over a year, it wasn't until it was chosen for the February group read over at the Kindred Spirits group that I finally decided to read it. We chose the book as one "in the spirit of" the works of L. M. Montgomery (i.e., "Anne of Green Gables") and, while Harris' book doesn't equal LMM's in my esteem and affection, I think it was definitely a good choice as it is evocative of LMM's adoration of nature, love of beauty and writing, and her position that girls and women have equal intelligence to men (even in a time when many would argue against it) and deserve a chance at education and a career. The book follows the story of the four Purcell sisters in England beginning in 1910 up through 1920 from youngest Sarah's perspective. The first portion of the book was probably the slowest for me--it took me awhile to get really interested in the characters, whether because Sarah's ten-year-old perspective was itself limited or due to deficiencies in Harris getting the story moving I cannot say. However, the story and characters become much more absorbing as the war years begin and Sarah becomes more aware of the world beyond her own home and village. She also becomes more aware of her sisters as complex human beings. And the girls' relationship with the McKenzie boys deepens (whose father and mother became guardians of the girls when their mother died) all regarded as friends, some as brothers and some as love interests. There are some heartbreaking chapters during the war years, but ultimately the story leaves off on a note of hope and new horizons--at least for Sarah. And much of the book involves the quiet, cozy home life near the beautiful Quantock Hills that are so dear to many of the characters, for a variety of reasons. There are some really beautiful and astute passages in this book that just "got" me. Aside from the rather slow beginning, I was utterly absorbed. I would have been happy with more character development, especially for middle sisters Julia (the happy domestic and helpmate) and Gwen (the gardener), but I suppose I will have to read their stories in the sequels. The characters that stood out the most for me, besides Sarah, were eldest sister Frances (the opinionated, sometimes selfish ever alluring, artist); Gabriel, the eldest McKenzie brother who is very kind to Sarah but has his heart set on Frances; and the Purcell sisters' cheerful, wise housekeeper and friend, Annie. All in all, I definitely recommend this book to anyone looking for books "in the spirit of" LMM's. I found this at the library sale. My version is from the British publisher (I admit that the fact it still had the original price tag in pounds added to the charm!) and is called "The Silent Shore" but has the same cover art. What beautiful writing. I love the way Ms. Harris set the scene. Sarah's story, is about four sisters who are orphaned in 1910, and this book is the youngest girl's story. It starts off when she is seven years old, and takes us till she is seventeen. I guess the easiest way for me to describe this book would be a mix between Little Women and Rilla of Ingleside. Neither of those books are perfect summer tales, but both have a sweetness that this book does. Sarah is very much a mix of Jo and Amy, What beautiful writing. I love the way Ms. Harris set the scene. 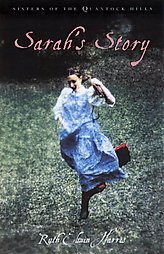 Sarah's story, is about four sisters who are orphaned in 1910, and this book is the youngest girl's story. It starts off when she is seven years old, and takes us till she is seventeen. I guess the easiest way for me to describe this book would be a mix between Little Women and Rilla of Ingleside. Neither of those books are perfect summer tales, but both have a sweetness that this book does. Sarah is very much a mix of Jo and Amy, but with Beth's quite sweetness. Since we see everything through Sarah's eyes, other people can be hazy and seem unkind because we only see how they act with her. That makes the book rather bittersweet, because Frances, Sarah's oldest sister is like Jo (little women), she is bohemian, an artist and nothing under the sun is worth as much to her as her work, at least that's how Sarah sees it. In some ways I feel that Frances is the heroine just as much as Sarah because Frances is a flamboyant character, she doesn't let anyone ignore or forget her. And sometimes I wished she would disappear under the floorboards and stop ragging at everyone. Sarah is hopeless in love/enamored with Gabriel, who unfortunately only has eyes for Frances (she is more his age anyway), and so much of what Sarah does it to please him, make him happy and to take the sting out of Frances' sharp tongue. I did enjoy this book, and I'm going to read the next three books in the hopes that Sarah will find what she's looking for, Julia will find peace, Frances will see what's more important that art before it's too late and that Gwen will find a voice. First in an outstanding four book series about four sisters - Frances, Julia, Gwen and Sarah Purcell - and their neighbors, the Mackenzie boys. Set during the early part of the 20th century and during WWI, this one (which I think is the best) is told from the perspective of Sarah, the youngest sister. I like that the author didn't write the books chronologically. In fact, the stories all overlap somewhat but as the youngest, Sarah is also the best observer of the others. Sadly this author has onl First in an outstanding four book series about four sisters - Frances, Julia, Gwen and Sarah Purcell - and their neighbors, the Mackenzie boys. Set during the early part of the 20th century and during WWI, this one (which I think is the best) is told from the perspective of Sarah, the youngest sister. I like that the author didn't write the books chronologically. In fact, the stories all overlap somewhat but as the youngest, Sarah is also the best observer of the others. I really enjoyed this beautifully written story of four young women/girls who become orphans but are unwilling to leave their family home and move to Taunton, played out in the years before and during WWI. Instead they are able to stay with supervision by the vicar and his family. Each of the sisters has their own unique gifts and personalities but are committed to staying together at Hillcrest. I am intrigued enough to search out the other three girls' stories. This is actually a 4.5 rating, not quite "amazing" but a beautiful read! I love the concept of a series in which each book is written from the point of view of each of four sisters. In this first volume, Ruth Elwin Harris somehow captures the spirit of Sarah, the youngest sister, thru her growing up years. I could feel her awkwardness in certain social situations, her thrills at simple pleasures and privileges, and her "tween" dilemma of both reluctance and hurry to grow up. I can see how each o This is actually a 4.5 rating, not quite "amazing" but a beautiful read! I love the concept of a series in which each book is written from the point of view of each of four sisters. In this first volume, Ruth Elwin Harris somehow captures the spirit of Sarah, the youngest sister, thru her growing up years. I could feel her awkwardness in certain social situations, her thrills at simple pleasures and privileges, and her "tween" dilemma of both reluctance and hurry to grow up. I can see how each of the four sisters will have a very unique perspective on the same events going on around them. The first time I read this book I was 12 years old. Ten years later I am still re-reading and enjoying it. The Purcell-stories are wonderful. No matter how many times you read about them, you never grow tired of the Purcells and the Mackenzies! I'm quite in love with all of them! While looking up information about the VAD's (in the Imperial War Museum) for writing Julia's Story, the author found this letters of Billie Nevill, a guy serving in WW 1. She wrote a book about him later. It is a really The first time I read this book I was 12 years old. Ten years later I am still re-reading and enjoying it. While looking up information about the VAD's (in the Imperial War Museum) for writing Julia's Story, the author found this letters of Billie Nevill, a guy serving in WW 1. She wrote a book about him later. It is a really touching story too. I would warmly recommend this book to everyone who liked Ruth Elwin Harris' other books and is interested in WW 1 ! It's as if Ruth Elwin Harris was commissioned to write a book that I would love: the time, the place, the delicate prose, the flowers and sunlight, the sweetness and the melancholy. It's just what I needed at this moment. And my name is on the cover! This book was picked as a group read. It was sweet and I found the younger age Sarah to be enduring in her innocence. Even her crush on the older Gabriel is cute and understandable. For most of the book though, I kept waiting for something to happen. It just seemed to go on and on - something would happen and then a sentence or two and it's over. It became difficult for me to finish the book. The best part for me was when Sarah encountered Geoffrey in the cemetery. I remember thinking, finally s This book was picked as a group read. It was sweet and I found the younger age Sarah to be enduring in her innocence. Even her crush on the older Gabriel is cute and understandable. For most of the book though, I kept waiting for something to happen. It just seemed to go on and on - something would happen and then a sentence or two and it's over. It became difficult for me to finish the book. The best part for me was when Sarah encountered Geoffrey in the cemetery. I remember thinking, finally something is going to happen . . he's distraught and she's there to see it and help him. But unfortunately, that excellent encounter ended too quickly and the book moved one. It's like someone brought up on the work of L.M. Montgomery wrote a book with a Suzanne Martin-esque (Song of Years) main character! Those two things equal perfection, by the way. I'd buy the rest of the series now, except I've accumulated a lot of books lately. (Which makes feel guilty. Stupid inexplicable, all-encompassing guilt complex...) Though I doubt I shall find them as kindred a spirit as my new friend Sarah, I'm eager to get to know Julia and Gwen. I have to admit, I am less interested i It's like someone brought up on the work of L.M. Montgomery wrote a book with a Suzanne Martin-esque (Song of Years) main character! I'd buy the rest of the series now, except I've accumulated a lot of books lately. (Which makes feel guilty. Stupid inexplicable, all-encompassing guilt complex...) Though I doubt I shall find them as kindred a spirit as my new friend Sarah, I'm eager to get to know Julia and Gwen. I have to admit, I am less interested in Frances. Perhaps because she was in Sarah's Story quite a bit and she irritated me half of the time. Set in England during WWI, this is the first in a series of four books about four sisters. Sadly, they are out-of-print, although still readily available. I’ve had these on my to read list for several years and this one certainly lived up to my expectations. I’m really looking forward to the rest. This was a perfect book for me -- set in a time (1910-1920) and place (England) that I am endlessly fascinated by, written by someone who clearly understands that time and place from the inside, yet who has enough perspective on it that she never becomes sentimental -- or at least not too much so. There is a definite feminist thread running through the book, in the struggles of the various characters to make a life they choose rather than simply follow the pattern society expects, but it is not This was a perfect book for me -- set in a time (1910-1920) and place (England) that I am endlessly fascinated by, written by someone who clearly understands that time and place from the inside, yet who has enough perspective on it that she never becomes sentimental -- or at least not too much so. There is a definite feminist thread running through the book, in the struggles of the various characters to make a life they choose rather than simply follow the pattern society expects, but it is not overt, and the possibilities seem very realistic to me, neither too much freedom for the period nor too little given the class aspects of it. I wanted to love this book, it is a lovely premise. Unfortunately, it seemed disjointed and confusing. It was episodic, but the episodes seemed to have no continuity, and the years changed often. As it is the first in the quartet and Sarah us a young child, I can only hope the other girls are more coherent. Lovely writing. Like PBS Masterpiece period drama. Most of the characters blended together because only a few had distinct characteristics that differentiated them from one another. I read the book half way and was so disinterested I did not want to finish. I did skip to the last chapter though and was just as disinterested and unamused. The back of the book summary/teaser was not a good representative of the story line. I would categorize this as a historical fiction. I found this book slow at first, but it grew on me. It's a literary, old fashioned style book set in England before and during WWI. It would appeal to readers who like a literary challenge and who enjoy historical fiction. It's a gentle read. Although I don't think it has wide appeal, I do think there are some teen readers who would enjoy it. Frankly I found the whole series rather boring and ended up skimming alot. In the first book I was appalled at how cold the older sister was to her grieving younger sister Sarah, I couldn't get past that. I really enjoyed the character development in this beautifully told historical fiction tale. Sarah is a such a sweetie - I'm so glad I got to meet her and will definitely look into reading the other three books in this series. I liked this one, but wanted it to be fleshed out a bit more. Interesting idea to have four books from four perspectives essentially telling about the same time period, but I think it would have worked better if it was done in first person. A nice an easy read. Probably best for women since it's all about a bunch of sisters. it was a amazing book! Another i Ruth Elwin Harris says that her historic quartet of novels, THE SISTERS OF THE QUANTOCK HILLS, had its beginnings while she was growing up during World War II. To escape the wartime bombing, she and her brother were sent to live with their grandfather in rural Somerset, England. His house and garden became the model for Hillcrest, the Purcell sisters' family home in the four-part series.